Technology advancement is moving so fast these days with exciting new opportunities sprouting up everywhere. Some of this technology seems silly (do we really need photo filters with dog ears? ), while others are truly innovative. Intelligent lockers are one of those forward-thinking technologies, and while they continue to improve based on customization for specific industry needs, they are absolutely making businesses, schools, and organizations better. Everyone has experienced losing keys at some point in their life, and it is never an enjoyable experience. While not as painful as a dental visit, it certainly wastes time, productivity and resources. Issuing a new key and replacing a lock can take several days, and when it is happening in a large company, it could quickly add up in lost resources and costs. Easier for both employers and employees (or administration and students/staff), intelligent lockers don’t need to be rekeyed. Instead, a pin code, fingerprint or ID badge can be used to access the locker. If an ID badge is lost or damaged, it can simply be deactivated and a new one created all within minutes, and often without even leaving a desk. Low downtime means less money out of the organization’s pocket and a quicker return to the employee or student’s regular schedule, making it a win-win. This additional security – the use of personalized access rather than a key or combination, means enhanced security as well. Employees/students no longer need to carry around expensive headphones, laptops, or other equipment such as musical instruments, photography gear, art supplies, calculators or more, because they can have a truly secure intelligent locker. Businesses and organizations are always looking for ways to improve their bottom line, and intelligent lockers are one solution towards that goal. As mentioned, costs for rekeying, as well as productivity losses can be reduced by using non-key locker systems. However, the additional benefit of secure lockers allows employers to track specific high-value supplies and access to those. For example, hand-held scanners or even consumable products that tend to disappear too quickly. Every time any locker is accessed, it creates an audit trail, which is important for accountability and security. It can even prevent after-hour access or access for certain employees outside of their working hours, further reducing the chance of loss or theft. In a police station: intelligent lockers used to store evidence; to safely manage guns/tasers and other safety equipment; to keep laptops and electronic equipment from being stolen from cruisers. In a university: intelligent lockers used to store oversized specialized equipment in a music room; to hold student supplies that can’t go into a testing center; to create security for valuable AV equipment. In a warehouse: Intelligent Lockers to limit access to ordered parts; to give access to employees to specific work-critical supplies. In a business: to allow employees to store their smartphones and other devices not allowed in the workplace. 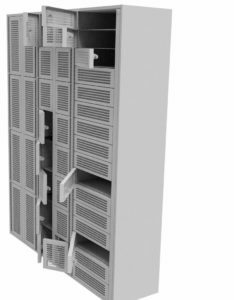 In each scenario the organization’s goals are considered, as well as the space considerations, and desired aesthetics to create a truly customized and expandable system of intelligent lockers for the best outcomes.